The healing process starts with recognizing and using the help around you. Every individual experiences some form of grief and trauma within the vast spectrum of life's challenges. It is remaining neglectful of the healing resources around us that often determines the quality of life we maintain. Challenge Behavioral Healthcare provides a client-centered approach that recognizes every individual's strengths and potential to bring about personalized recovery. Our reputable staff reflects the qualities and expertise that should be found in the most highly trained, knowledgeable, and compassionate of healthcare professionals. 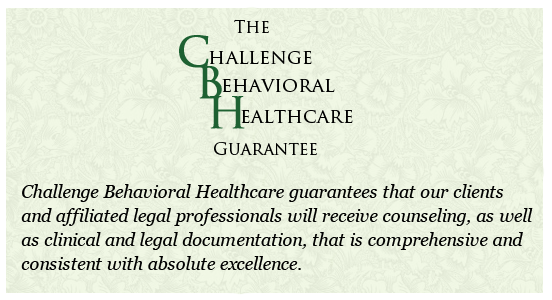 At Challenge Behavioral Healthcare, our individualized treatment programs are tailored to the client's needs. Regardless of the therapeutic modality that an individual or family may require, all clients receive courteous attention, strict confidentiality, and clinical excellence.